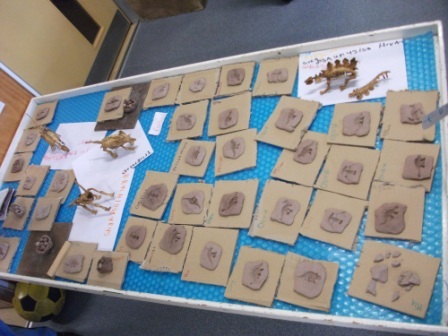 “We want to build a dinosaur museum” said the children and from those few words an exciting investigation into dinosaurs began. 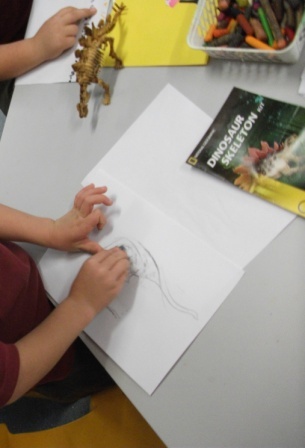 We talked about the role of curators in museums and the children selected a dinosaur so they could curate their own exhibit. 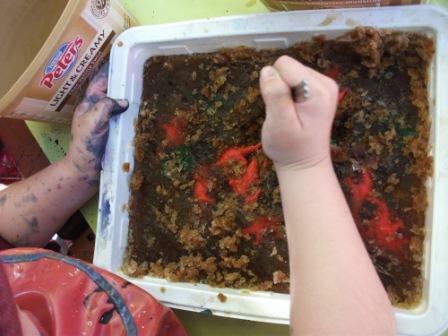 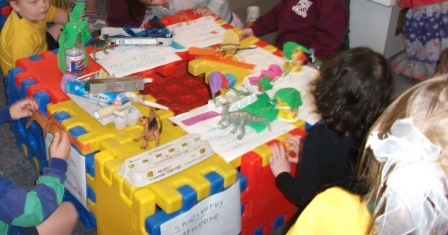 To solve the issue of who would have which dinosaur the children took turns being paelentologists digging a dinosaur out of a sensory tub. 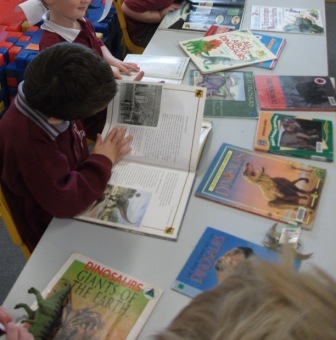 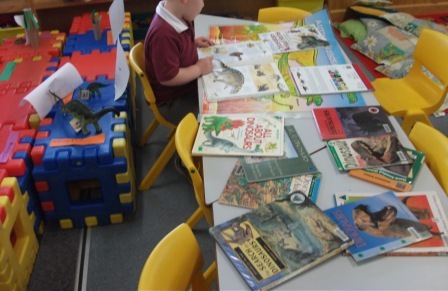 The children were unfamiliar with many of the dinosaurs in the collection and needed to do some research to discover their dinosaur’s name and other information. 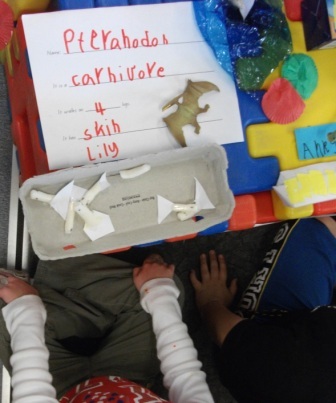 They copied the names of their dinosaurs to make signs for the exhibits. 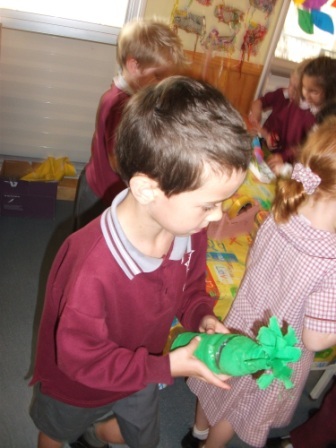 Lots of the dinosaur names were really tricky and we had fun clapping out the syllables and trying to remember what they were called by sounding out the letters. 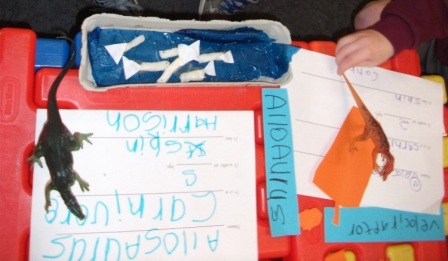 Thankfully most dinosaur names are phonetically correct. 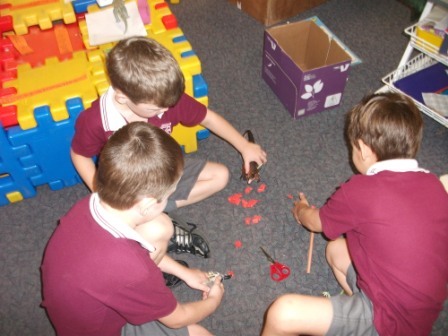 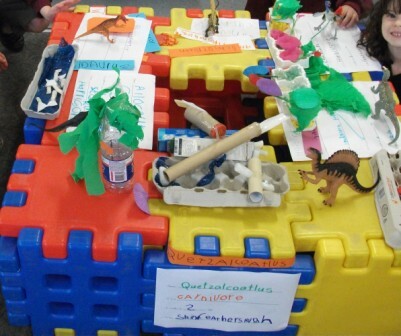 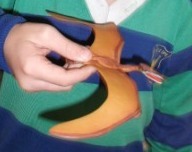 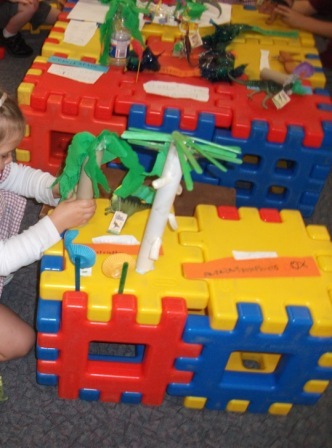 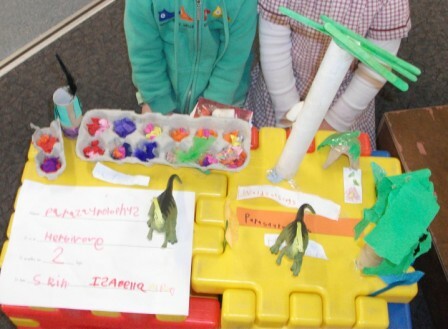 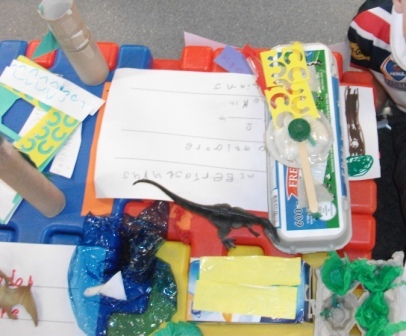 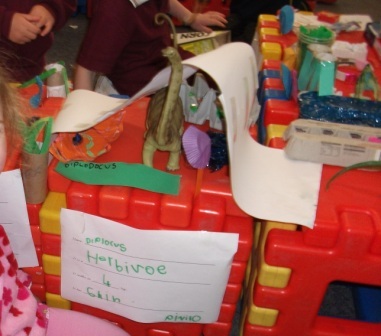 Once the museum areas were built the children decided to create environmental displays for their dinosaurs. 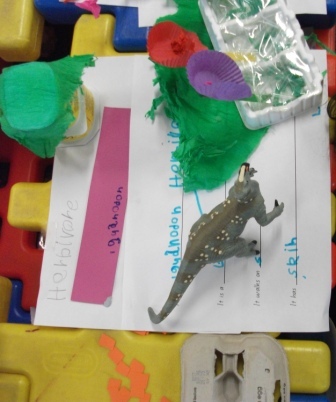 They discovered what their dinosaur ate and put this food into the display along with where they lived. 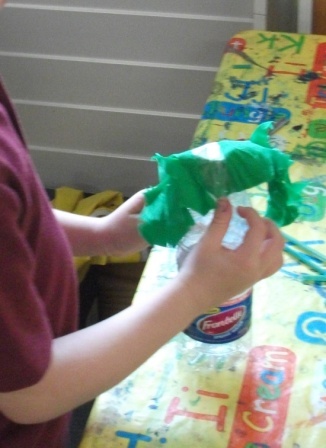 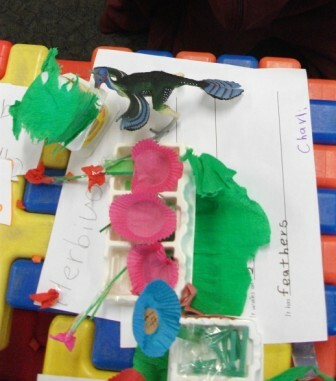 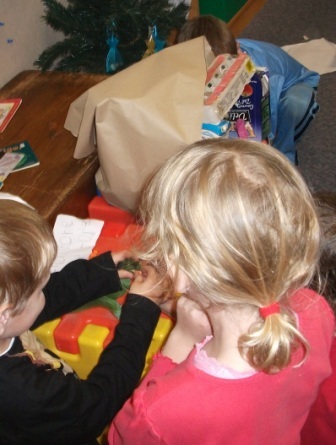 Many of the dinosaurs were herbivores and the children made plants from the collage materials. 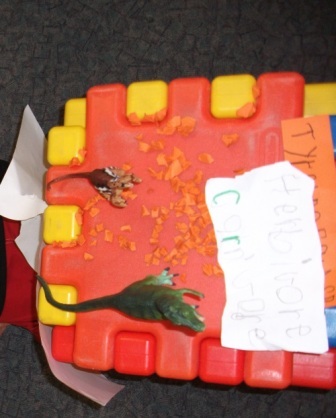 The carnivores were given meat made from red paper. 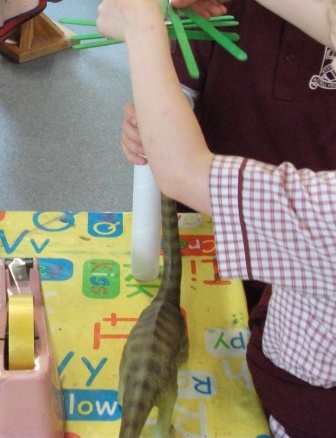 Lots of measurement was incorporated into curating the displays as the children ensured their trees and other props were tall enough for the dinosaurs. 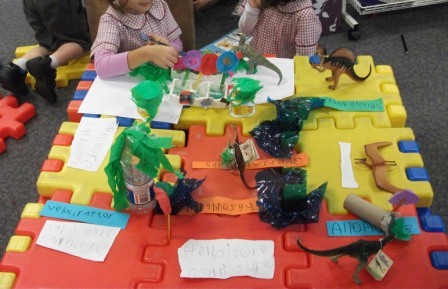 Information Reports were written to provide all the museum visitors with the same kind of information about the dinosaurs. 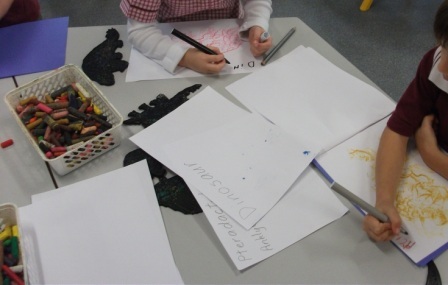 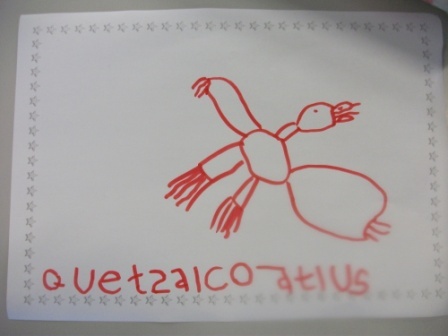 On the reports the children identified the name of the dinosaur, if it was a Herbivore/Carnivore/Omnivore. 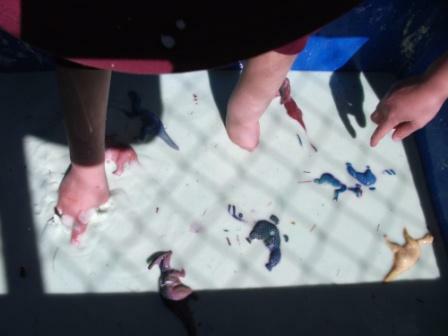 How many legs they walked on and the kind of skin covering they had plus something else of interest. 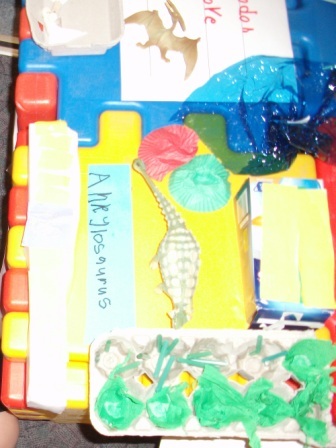 These reports were added to the exhibits. 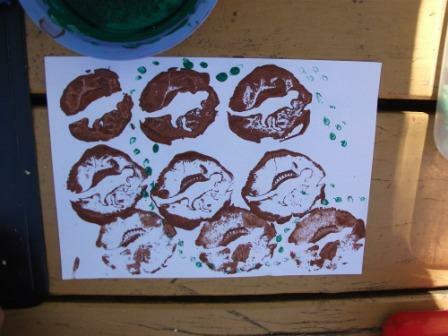 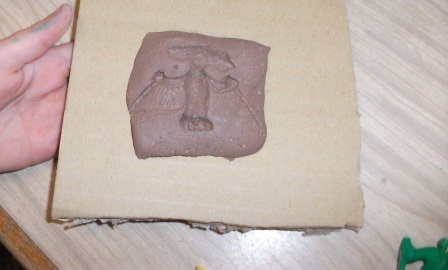 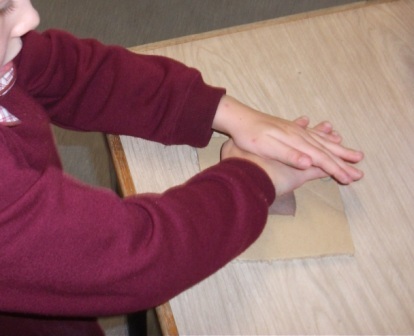 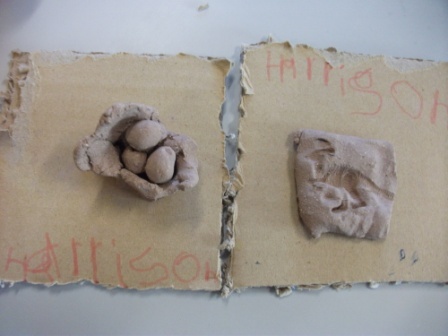 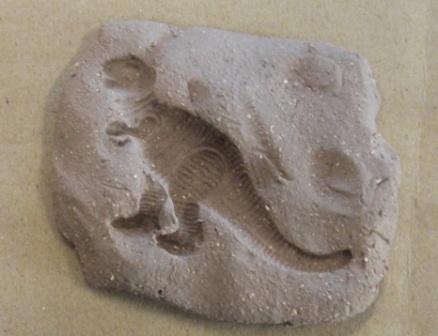 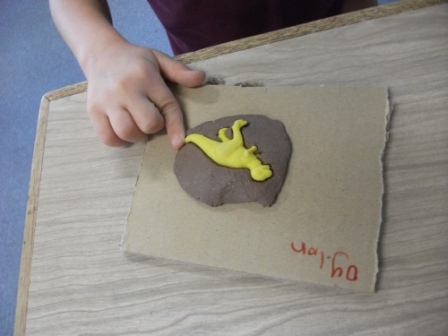 The children also made fossil rubbing books to sell and made clay fossils to display in the museum. 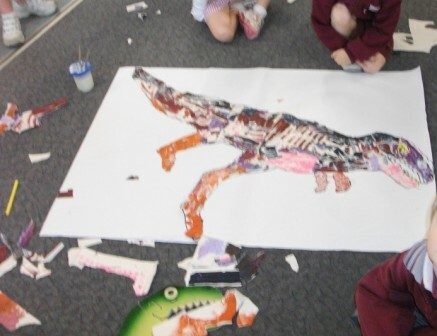 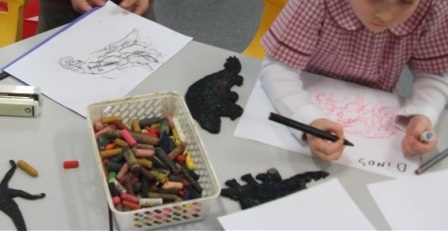 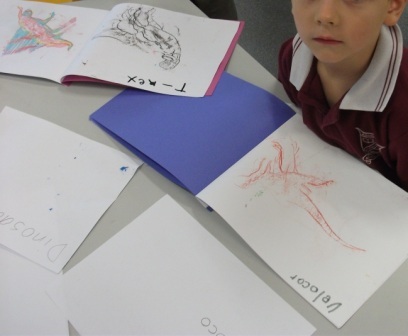 The children traced around the dinosaur floor puzzles to create art for the museum. 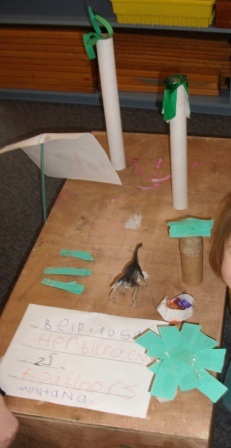 Finally, when all was ready, the Prep class next door was invited in to view the dinosaur exhibit. 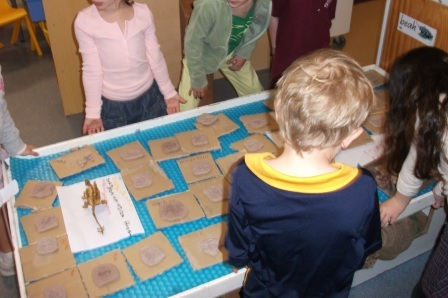 Each curator shared their knowledge with the visitors. 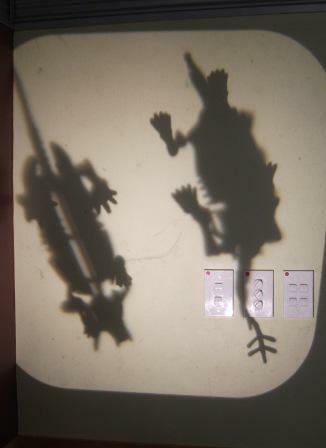 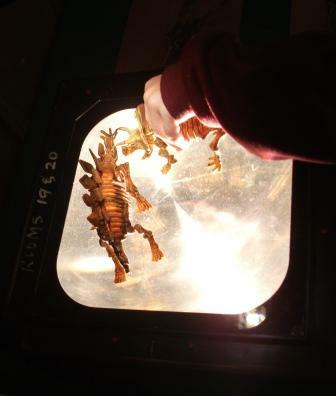 Exploring fossil skeletons on the overhead projector. 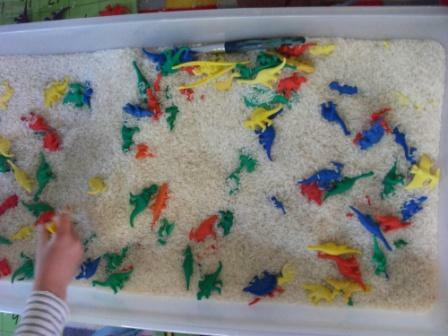 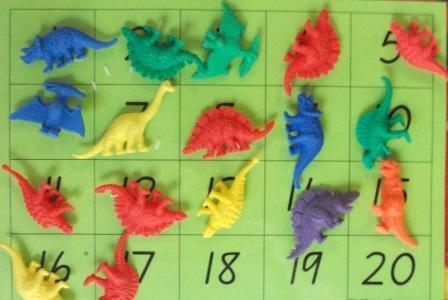 Dinosaur counting in a sensory tub of rice. 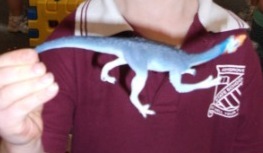 Blue is a quiet colour. 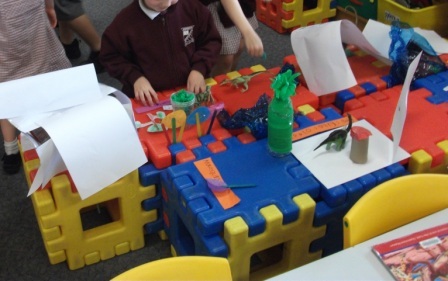 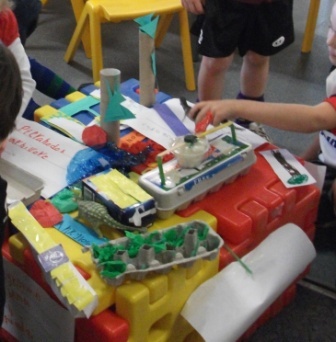 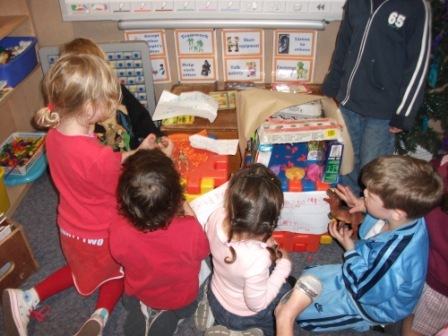 What a wonderful example of play based learning and intentional teaching … Now if only we could get every primary school to teach our children this way!